I live in a home where gumbo is made by a self-taught Irishman from Chicago: my husband. Gumbo is Mac’s Christmas Day specialty, and his version — based on two Paul Prudhomme recipes tweaked umpteen times over the years — is among the finest gumbo I’ve ever eaten. That’s easy for me to say, because until last week I’d never been to New Orleans. Granted, I don’t need to go to New Orleans to eat great gumbo. 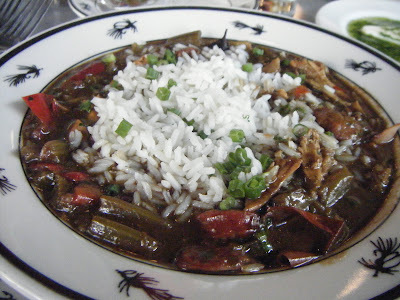 Instead, I can head to Pike Place Market, grab a seat at the counter at the Steelhead Diner and order up a bowl of chef Kevin Davis’s chicken and sausage gumbo. Steelhead gumbo: You can take the boy out of New Orleans, and the next thing you know he’s making gumbo — with Hempler’s smoked andouille sausage. Kevin is a former New Orleanian who made plenty of Creole specialties during his top-toque tenure at Arnaud’s in the French Quarter. He’s also my husband’s gumbo-making hero; even more so since divulging his trade secret: smoked ham hocks flavor his stock. Mac makes his gumbo with chicken (or, if I’m really lucky, duck), andouille (he prefers CasCioppo’s), shrimp (wild from the Gulf Coast if we can get them) and crab (Dungeness if we’re feeling flush, canned from Costco if we’re not). Mac’s gumbo, before he garnished it with Dungeness crab and rice. For stock, he uses Swanson’s chicken broth flavored with the shrimp’s shells (he uses a cheesecloth “bag” to steep them), plus the aforementioned smoked hock. P.S. Mac insists the Northwest-styled gumbo served with fresh Dungeness crab as a special at Brad Inserra’s Swingside Cafe in Fremont is every bit as good as Kevin’s Steelhead Diner gumbo — if not better. I’ll second that motion and note that Brad is born and raised in Pittsburgh, proving once again that you don’t have to be from New Orleans to make a memorable gumbo. 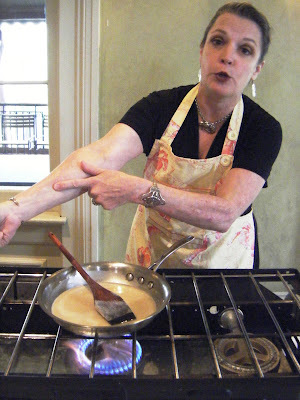 Poppy Tooker, the celebrated New Orleans cook, author, television personality and ball-‘o-fire I met on my trip, says anybody can make a great gumbo — so long as they get the roux right. She’s also the spiritual midwife of Slow Food New Orleans and a mover and a shaker who helped the local food community get back on their feet post Hurricane Katrina. 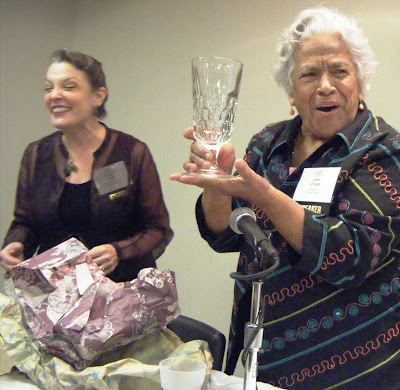 That’s Poppy below in a hotel conference in New Orleans, laughing it up with the delightful “Queen of Creole Cuisine” Leah Chase, owner/chef of Dooky Chase. 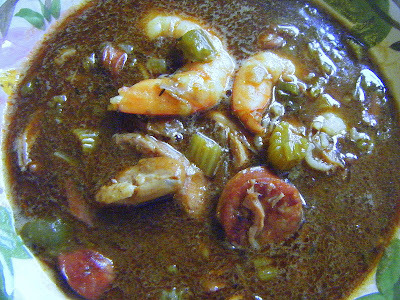 Last week Poppy gave a verbal harrumph when her dear friend Mrs. Chase suggested that cooks in a hurry can find all sorts of shortcuts to making southern food classics like gumbo (see: Swanson’s, above). Poppy’s on the left. Mrs. Chase is joyfully holding aloft a special gift: a proper celery vase — just like they used for “fancy” back when she was a girl. 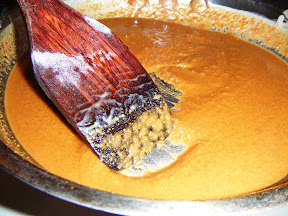 Poppy, bless her heart, holds no truck with folks who don’t want to take their time to make something as simple and necessary to a proper gumbo as a roux; folks who choose, instead, to pop the lid of a jar of the stuff that’s sold on the grocer’s shelf. 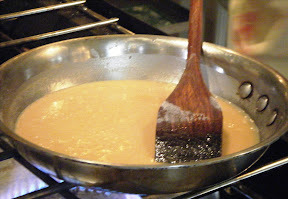 Mac’s tried the pre-made roux, courtesy of a colleague from the south who swears by it and mailed him a jar. But he prefers to make his the “right” way. And that’s what Poppy did during a show-and-tell where I was fortunate enough to taste her justly famous seafood gumbo — winner of a Throwdown with Bobby Flay, doncha know. In fact, her seafood gumbo is so fine, Fine Cooking celebrated it in a multi-page spread that included her recipe (try it, you’ll love it). 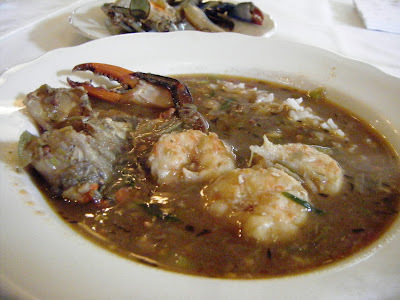 Interestingly, Mrs. Chase, an octogenarian who’s made a river’s worth of gumbo, recalled that in the 1940s you didn’t find gumbo in New Orleans restaurants. “That was home cooking,” she told a the Association of Food Journalists last Wednesday. Instead, you’d eat turtle soup. But at home, now that was a different story. 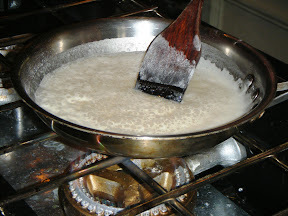 Poppy rues the day she didn’t take her own advice regarding the roux. 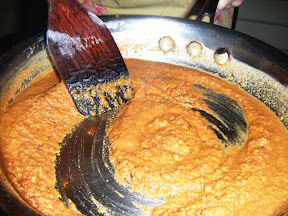 And as that roux darkened, Poppy told a story that had me slapping my knee: When she was in Seattle in June promoting her new Crescent City Farmers Market Cookbook, she met Uli Lengenberg of Uli’s Famous Sausage. When Uli heard she’d be traveling around town making gumbo, he told her, “You need to use my an-DOO-LEE!” So she did. Then, as she traveled to farmers markets in Ballard and Phinney Ridge and gave gumbo-making demonstrations at Williams-Sonoma in Bellevue, folks were hesitant to try her gumbo. “They’d ask, `Is it spicy? '” Poppy said. And she’d say no, but still, they were slow to reach for a spoon. “Then I’d say, `I’m using Uli’s andouille,'” she said, and with that they’d smile and happily eat her gumbo — the one with the familiar Seattle accent. 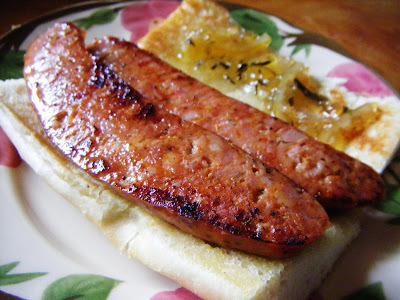 Today’s lunch: a Hempler’s andouille sausage sandwich with a “Slow Food schmear”: homemade zucchini-lime marmalade from my pal Rebecca Staffel. Comments | More in Chefs | Topics: Get out of town!